Proprietary Name: Delsym What is the Proprietary Name? 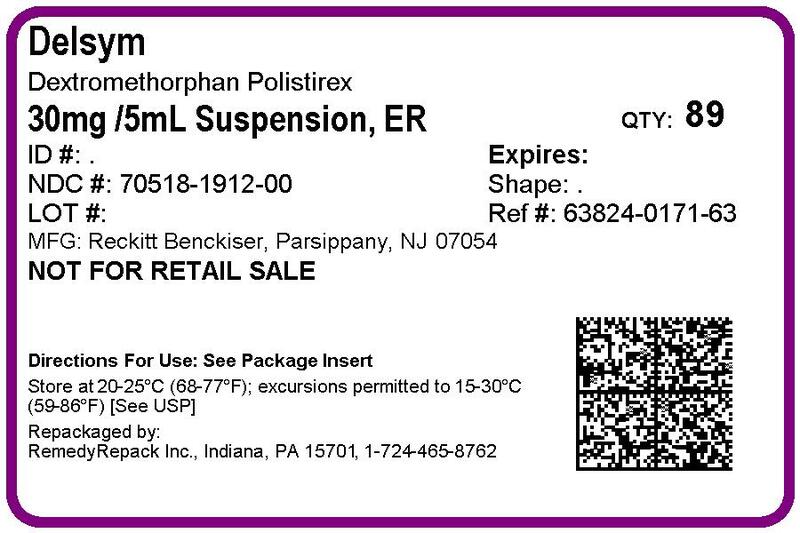 Non-Proprietary Name: Dextromethorphan What is the Non-Proprietary Name? Delsym with NDC 70518-1912 is a a human over the counter drug product labeled by Remedyrepack Inc.. The generic name of Delsym is dextromethorphan. The product's dosage form is suspension, extended release and is administered via oral form. Dosage Form: Suspension, Extended Release - A liquid preparation consisting of solid particles dispersed throughout a liquid phase in which the particles are not soluble; the suspension has been formulated in a manner to allow at least a reduction in dosing frequency as compared to that drug presented as a conventional dosage form (e.g., as a solution or a prompt drug-releasing, conventional solid dosage form). FDA Application Number: NDA018658 What is the FDA Application Number? 1-866-682-4639You may also report side effects to this phone number.